Neil is a Portfolio Manager at Echoing Green, managing 32 entrepreneurs and their start-ups tackling climate change. He is a Global Shaper and a Forbes Contributor focused on elevating climate change solutions and social entrepreneurs. Prior to Echoing Green, Neil was a management consultant with 5+ years of strategy and operations experience in international development firms - Dalberg and Social Ventures Australia and corporate firms - Accenture and KPMG. Neil has successfully delivered projects with clients across multiple sectors – including energy, government, utilities, finance, agriculture, and information technology. Neil graduated on the Dean’s list and with Distinction from an MBA at the University of Oxford where he was also elected as a Skoll World Forum Fellow and the Energy, Environment and Resources Oxford Business Network Chair. He has a triple degree in Mechatronic Engineering (1st Class Honours), International Business, and Management from the University of Adelaide and the University of Hong Kong. Glasha Marcon is intentionally and strategically working across sectors to measurably and equitably improve community and global health and resilience. She believes that bringing together individuals plants the seed for connecting institutions. Glasha works as an Innovation Lead at Optum – the technology and services arm of UnitedHealth Group – leveraging Systems Thinking, Service Design, and Lean Startup to create new products and services in the US and Brazil. She also works internally to shape UHG’s social determinants of health (SDoH) and health equity strategies. Glasha was born to Russian immigrants in San Francisco and relocated to the Twin Cities in 2009 to study International Health and Development at Macalester College. She recently moved back to Oakland, and is excited to bring her energy and skills to the intersection of health, equity, and climate. Jerica is a Project Specialist at the World Economic Forum Center for the Fourth Industrial Revolution where she supports the design of policy and governance frameworks that accelerate the adoption of emerging technologies for the benefit of the environment. She was previously a Social Impact Consultant at Third Sector Capital Partners, a nonprofit advisory firm that specializes in developing and deploying outcomes-oriented strategies to align resources with results for communities. She has a variety of leadership experiences, including being a Global Shaper at the World Economic Forum, a Social Innovation Fellow at the StartingBloc Institute, a pro-bono environmental consultant with Seed Consulting Group, and she is a Bassist in the San Francisco Civic Symphony. Jerica graduated from the University of Central Florida with a B.A. in Economics and a minor in Political Science, where she also received 30 under 30 Alumni recognition. Andrew is a Houston-native who is passionate about the intersections between technology, entrepreneurship, and social responsibility. He studied computer science at Swarthmore College and worked as a intern for the Center of Innovation and Leadership, where he established relationships within the Philly startup scene and developed alumni relationships. Currently, Andrew works as a software engineer at Salesforce where he develops custom-branded b2b mobile apps. He hopes to continue applying his liberal arts background to enable interdisciplinary collaboration and social change. Isha graduated from the University of Southern California in 2017 with a degree in Economics / Mathematics and Finance, with a focus on international development and social entrepreneurship. Through Los Angeles Community Impact (LACI), she led pro bono consulting projects for nonprofits and social enterprises in the greater LA area. She also interned at the Brittingham Social Enterprise Lab, which developed programming and mentorship opportunities for USC students interested in social entrepreneurship. She studied abroad at the London School of Economics, where she took courses on development economics and the economic history of developing nations. She currently works as an strategy consulting Associate in Parthenon San Francisco, where she primarily diligences potential acquisitions for private equity clients. She also heads Client Development for the Parthenon SF chapter of Inspire, which is a national organization that provides low-cost strategic consulting services to nonprofits. 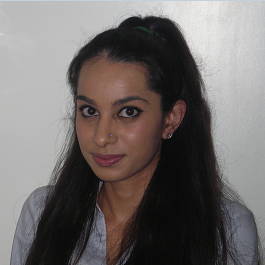 Faryal is a young professional whose analyst role relies heavily on in-depth analytical knowledge coupled with a mastery of technological capability. She works at Bank of the West where she supports several groups to foster critical transformation and revenue growth. During her time at the Bank she has held roles in finance and in business intelligence. She graduated from Saint Mary’s College of California in 2014 with a degree in Business Administration and Economics. When she is not working, Faryal enjoys traveling, reading, and as a self-proclaimed foodie – eating her way through San Francisco. Sam is passionate about using design, design thinking and design advocacy to create a better built and natural environment. Originally from Brisbane, Australia he now works in New York. Sam has been a project employee of Emergency Architects Australia, including coordinating a response to the 2011 Queensland floods and has 7 years experience practicing architecture at James Davidson Architect. He currently maintains a research appointment at The University of Queensland on resilience and planning policy. Recently, he has been project managing SEQ Waterfutures- an initiative promoting collaborative planning and regulatory reform towards resilience in the state of Queensland. He has a background in design thinking and facilitation, having run workshops in Australia, the USA, Indonesia, the Netherlands and Switzerland. Sam graduated as the top Master of Architecture student in Queensland, winning five of nine graduate prizes including the Australian Institute of Architects' QIA medallion. He has studied at The University of Queensland, Technische Universitat Berlin, University of British Columbia and University of California, Berkeley. Risalat Khan is a social justice activist and intrapreneur from Bangladesh passionate about addressing climate change, biodiversity loss, and other planetary-scale sustainability challenges. He was recognized by The Guardian as one of the “young climate campaigners to watch” (2015). As a campaigner with the global civic movement Avaaz (2014-2017), Risalat was part of a small core team that spearheaded the largest global climate marches in history with a combined turnout of 800,000 people worldwide in over 2,000 cities. He recently graduated with a Masters of Public Administration in Environmental Science and Policy at Columbia University. Bolor constantly challenges herself with new areas of focus on her work and life. Her work experience ranges from procurement to marketing, to supply chain management to sales and contract management. She graduated from Baikal National University of Economics and Law in Russia 2007. She has been an active Rotaractor since 2009, Rotary foundation GSE program alumni, charter secretary of Rotary club of Ulaanbaatar Peace Avenue. She is currently based in New York pursuing a Master's in Environmental Science and Policy at Columbia University in New York.